Safe ways to sweeten the day for people with food allergies Some twelve million Americans suffer serious allergic reactions to nuts, dairy, gluten, and other ingredients typically found in desserts. Finally, here's a collection of delicious dessert recipes offering a safe option for allergy sufferers who don't want to give up their favorite treats. Even though these recipes are completely free of gluten, dairy, nuts, soy, and eggs, you'll hardly notice the difference. 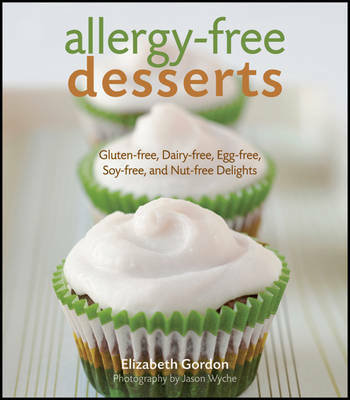 Allergy-free Desserts includes recipes for all of your favorite baked treats-cakes, cupcakes, pies, quick breads, cookies, and dessert bars. Written by Elizabeth Gordon, herself allergic to eggs and wheat, this indispensable cookbook will finally let you enjoy desserts safely again. * Featuring 82 recipes and 44 full-color photos* Recipes that taste just like the real thing-but without the gluten, dairy, nuts, soy, or eggs* The perfect dessert cookbook for the millions of people who suffer from food allergies or Celiac Disease Allergies shouldn't hold you back. Allergy-free Desserts finally lets you indulge your sweet tooth.